But that’s today when the online-offline division may be near 50-50 overall and is 75-25 for certain niches. If those numbers become 75-25 and 90-10 over the next five years, the bookstore market really won’t matter that much to most authors anymore. Whether through self-publishing or through some fledgling publisher that doesn’t have today’s big publisher capabilities but also doesn’t have their cost structure, authors will feel that the big organizations are less necessary than they are now to help them realize their potential. via The future of bookstores is the key to understanding the future of publishing – The Shatzkin Files. What’s more you can package your content in any variety of ways. Make a podcast or your poetry and push it on iTunes. Act out your play and upload it to YouTube or your preferred location. It is easy to do it all now and to do it well. Maybe the cost of a decent designer or video editor will take a summer to save for or a winter of being cold avoiding buying new jumpers but the costs are so achievable it is exceptional. The point is that publishing is no longer just about books and even more it is no longer about waiting for a publisher to decide your work is good enough for print. Options abound and as more and more writers realise that they will take advantage of it. E-books will push this change even more. There is no reason why authors’ royalties should be the same on e-books as they are for paper books and in many ways there is no reason why the authors cannot sell e-books themselves rather than through a publisher. Why should you sell a paper publisher your digital rights when there is no need? Of course the real growth in power for authors is with two groups; the super successful authors who already command high advances and special treatment, and those who were never going to be published anyway. In both cases options abound for changing the current model. Where things are less easy to decide is the mid-list. Here, as bookstores fail and ebook sales gravitate towards the winners and the margins, there may be difficult years ahead for those who fall into either the average writer space or the average sales space. None of that solves the headaches publishers face! I’ve often written of the value of inaction in the face of an uncertain future. Today, I want to write about both the rewards and the costs of inaction in a specific case, Ireland and the ebook retail business. 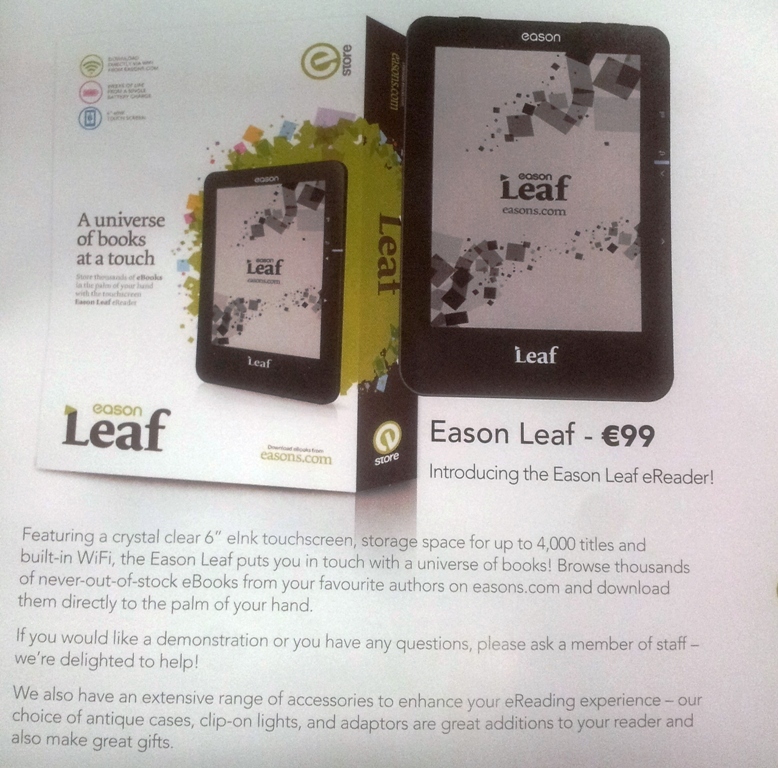 Eason, by far the largest bookstore chain in Ireland, is set to launch an ereader onto the Irish market in December. It’s called the Eason Leaf. To be fair to Eason, it has a natty offering, a 6-inch, touch-screen eInk device with weeks of battery life and storage for 4,000 titles. All for less than €100. It could plausibly become the best-selling dedicated ereading device in Ireland after the Kindle and create a mass market for ebooks sold via the Eason ebookstore. You could say that the company’s move is a great example of collecting the rewards of inaction. Having followed a sensible and cautious strategy in a period marked by uncertainty and using the intelligence it gained during that period, Eason acted decisively. It bought in a device from an OEM, branded it and is selling content directly to readers via its own ebookstore. In this way Eason can build a closed circle for its customers with itself at the centre and all the while build a digital retail position to rival its physical one. No doubt Eason has seen the work Barnes & Noble was able to do in the US, converting heavy book readers to Nook users through in-store selling efforts and hopes to replicate it. Even if you see the move as more defensive, ie a way to capture a limited audience of ereading book people, while ensuring the majority stay devoted to print, the strategy has the benefit of being low cost. I don’t often have praise for Eason, but in this instance I think the company has played a good hand. Given the choices available to Eason I think it has taken by far the best option it has. Kobo seems to be making the most of its distribution via chains like PC World (distribution which includes even the keenly priced Vox table at only €139 which packs a fair punch relative to the Leaf) but name recognition is low and no BOOKSELLERS seem to be on board except WH Smiths whose High Street retail presence in Ireland consists of one concession in Arnotts. Without a convincing way to reach the readers how will Kobo convert them from print to digital? Nook‘s plans are mystifying though the company does seem to be offering to ship tablets and ereaders to Ireland from its UK Nook site. If Kobo has a name recognition problem I wager Nook’s is far, far worse in Ireland. Nook then faces a huge challenge in establishing a name, a brand and a conversion strategy in Ireland. Apple is the only competitor with some chance of making gains in 2012, with the iPad mini, but in truth I suspect that device will not be a book readers choice. I’ll wait to see. The truth is though that all these companies could have acted more forcefully in Ireland at any time, it’s a small, English language territory with pretty friendly tax arrangements. It was inaction when the time called for action that led them to where they are now. The costs of inaction for the major Amazon rivals are first and foremost that a local competitor in a small local market looks set to steal a march on them. It seems so very unlikely but it’s really happening (I wonder who will be the first to pondering buying out the Eason operation should it prove successful?). In an English language market that could easily be technologically serviced from the UK or US (as Amazon does with Kindle) so long as the retailer made a small commitment on the ground marketing and brand building and converting print readers to digital, a small bookseller with great physical footprint and footfall but not much by way of a digital track record might just, strangely, be a leader in this shift from print to digital in Ireland. We always do things a little differently here! While a technology may change, Centrello said that a publisher’s core mission remains the same: To deliver books to readers. “A publisher’s job is to deliver books in any form that the reader wants to read them,” she said. via Gina Centrello: EBooks Will Be 50% Of Book Sales In Five Years – mediabistro.com: eBookNewser.